You don’t have to be an outdoor enthusiast to place the Grand Canyon on your bucket list. From teens to retirees, the Grand Canyon is a site to see from its magical rock formations to the sparkling rivers below. River trips are a great option to take in the beauty from the waterways and get to hikes you may not be able to access otherwise. But where to begin? Team Watershed athlete – Tess McEnroe – spills the beans! Silver Grotto on river left is a great spot to take a break from paddling. From this spot you usually need to set a rope to get up to the first pool level. TIP: You may want to keep a wet/dry suit on because it can get rather cold in the shade. For the geologists in the family, take a stop at Nautiloid Canyon for a look at some cool oceanic fossils. Before you hit Red Wall Cavern on your journey take a stop at Martha’s Crack – a beautiful hike on your river left. Skilled Hikers Only: Check out the Nankoweap Trail (an unmaintained hiking trail on the North Rim of the Grand Canyon National Park) but beware of the difficulty and lack of water during this trek. Nankoweap is unmarked and route-finding skills often come into play. Stop by the Unkar Delta (preserved ruins) as this is one of the largest archeological sites that attract visitors to the Grand Canyon. This large patch of sandy soil is found at a sweeping bend on the north side of the Colorado River at river mile 72.5, downstream from the Tanner Trail and upstream of Unkar Rapid. Rattlesnake hike is an epic and awesome place to make a stop on river right, before Hance rapid/inner gorge. Upper Elves is an incredible spot shared by those who know about it. Stop at the famed Elves Chasm on river left and belly crawl to the upper part of the falls for some fun jumping off points. TIP: Need some climbing skills for this part. 2. Thunder River up Tapeats Creek is a classic (the river gushes out of the red wall because of the aquifers inside). You can also head up and over to Surprise Valley which will drop you down to the throne room at Dutton Springs and then on down to the Deer Creek Patio (must see!). 3. After running Dubendorf Rapid, pull over on the right for Stonecreek. This area has gorgeous campsites with an epic hike all the way to the back. You can also do the Hardy Boys Crack which requires knowing the abstract route and solid climbing capabilities. 4. Tuck Up Canyon requires an ounce of extra energy but worth a walk. Just like most side canyons, it goes on and on forever and will take you all the way up to Shamans Gallery to see one of the most epic pictograph panels in the west. What are you waiting for? Pack up your sunscreen in your 100% submersible drybag and go! 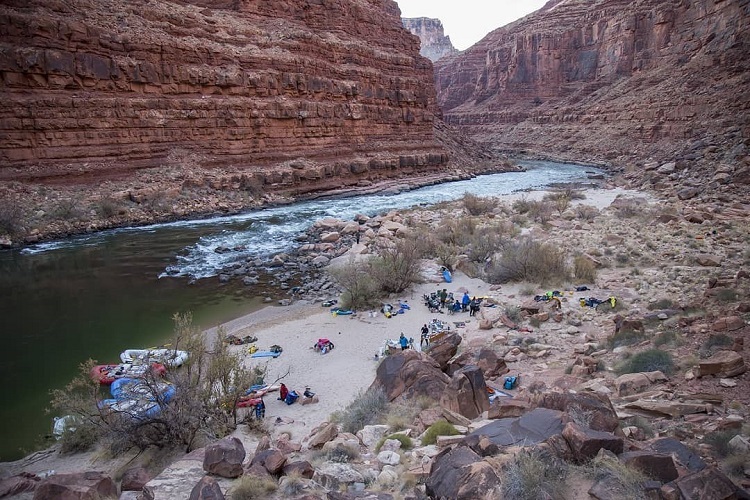 Although all our duffels and backpacks are great for the Grand Canyon, the Animas Backpack is perfect if you need to tie up the raft and hike in a bit. It offers enough room for a couple of days’ worth of gear, along with the convenience of removable backpack straps. Perfect for river trips!